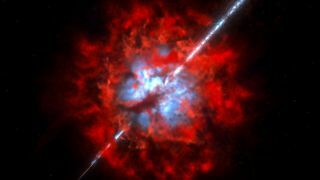 Artist's impression of a gamma-ray burst buried in dust. Astronomers using a giant radio telescope to investigate the most violent explosions in the universe, known as gamma-ray bursts (GRBs), found something surprising in two distant galaxies: more dust and less gas than they expected. So-called "dark GRBs" may explain a curious phenomenon for astronomers mapping out these powerful explosions in space. While most gamma-ray bursts have an afterglow, sometimes scientists don't see that luminescence. It is possible that thick interstellar dust may mask the light from dark GRBs. "We didn't expect that GRBs would occur in such a dusty environment with a low ratio of molecular gas to dust. This indicates that the GRB occurred in an environment quite different from a typical star-forming region," Bunyo Hatsukade, the lead scientist who performed the research with the National Astronomical Observatory of Japan, said in a statement. Observations of galaxy GRB 020819B of molecular gas (left) and dust (middle) done by the Atacama Large Millimeter/submillimeter Array (ALMA). At right is a visible-light image from the Frederick C. Gillett Gemini North Telescope. The cross indicates the site of a gamma-ray burst in the region. While telescopes have observed gamma rays for decades, less is known about gamma-ray bursts. Brief GRBs (they last less than two seconds) may be produced as two neutron stars collide. Longer bursts might happen when massive stars go supernova, collapse into black holes, and send out a surge of energy. Usually, a burst will send out as much energy as the sun will during its 10 billion-year lifetime. The accompanying afterglow is believed to happen after the thrown-off material crashes into the gas surrounding the explosion. Artist's conception of the environment around GRB 020819B. ALMA's results add to a growing stream of observations astronomers are making of the galaxies where these bursts originate. They believed the huge stars could be lurking in star-forming areas within the galaxies, which these latest results appear to contradict. The bursts might alter the environment, though. Dust would remain after the explosion because it's more robust than the gas, the astronomers suggested. Ultraviolet radiation from the explosion would break apart the bonds in the molecular gas. ALMA also made the first detection of carbon monoxide gas in a host galaxy. The array's dozens of telescopes are providing higher-resolution observations in radio and submillimeter wavelengths than ever seen before, its backers say. The astronomers added that more observations will be needed to better generalize what a GRB site looks like. Results were published this week in the journal Nature.